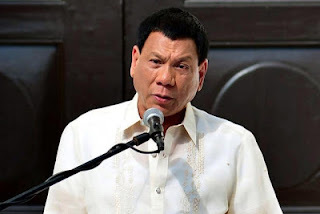 Philippine President, Rodrigo Duterte on Tuesday told U.S. President Barack Obama to "go to hell" because the United States had refused to sell some weapons to his country, adding that he did not care because Russia and China were willing to sell weapons to his country. Duterte said he was realigning his foreign policy because the United States had failed the Philippines adding that at some point, "I will break up with America". During three tangential and fiercely worded speeches in Manila, Duterte said the United States did not want to sell missiles and other weapons, but Russia and China had told him they could provide them easily. "Although it may sound s**t to you, it is my sacred duty to keep the integrity of this republic and the people healthy," Duterte said. On Sunday, Duterte said he had received support from Russia and China when he complained to them about the United States being unwilling to sell weapons to his country. He also said he would review a U.S.-Philippines Enhanced Defence Cooperation Agreement. The agreement is a deal, signed in 2014, that grants U.S. troops some access to Philippine bases, and allows them to set up storage facilities for maritime security and humanitarian and disaster response operations. Duterte said the United States should have supported the Philippines in tackling its chronic drugs problems but that instead it had criticised him for the high death toll, as did the European Union.